Smart structures that contain embedded piezoelectric patches are loaded by both mechanical and electrical fields. Traditional plate and shell theories were developed to analyze structures subject to mechanical loads. However, these often fail when tasked with the evaluation of both electrical and mechanical fields and loads. In recent years more advanced models have been developed that overcome these limitations. Plates and Shells for Smart Structures offers a complete guide and reference to smart structures under both mechanical and electrical loads, starting with the basic principles and working right up to the most advanced models. It provides an overview of classical plate and shell theories for piezoelectric elasticity and demonstrates their limitations in static and dynamic analysis with a number of example problems. This book also provides both analytical and finite element solutions, thus enabling the reader to compare strong and weak solutions to the problems. The models currently used have a wide range of applications in civil, automotive, marine and aerospace engineering. 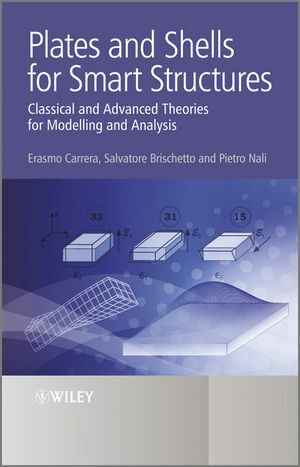 Researchers of smart structures, and structural analysts in industry, will find all they need to know in this concise reference. Graduate and postgraduate students of mechanical, civil and aerospace engineering can also use this book in their studies. Erasmo Carrera is Professor of Aerospace Structures and Computational Aeroelasticity and Deputy Director of Department of Aerospace Engineering at the Politecnico di Torino, Torino, Italy. He has authored circa 200 journal and conference papers. His research has concentrated on composite materials, buckling and postbuckling of multilayered structures, non-linear analysis and stability, FEM; nonlinear analysis by FEM; development of efficient and reliable FE formulations for layered structures, contact mechanics, smart structures, nonlinear dynamics and flutter, and classical and mixed methods for multilayered plates and shells. Dr Salavatore Brischetto is a research assistant in the Aeronautics and Space Engineering Department, Politecnico di Torino. Marco Petrolo is a research scientist in the Department of Aeronautics and Space Engineering at the Politecnico di Torino.